Holsworthy Community College pupils coped well with the new more demanding GCSEs this year. The new 9-4 equivalent measure to last year’s A*-C in English was 74% and in Maths 67%. It is very pleasing that 25% of pupils gained 3 A*/A or more which is an indicator for our Higher Attainers. Over a third, 37%, of all Year 11 pupils gained at least one A*/A grade. Sam Quance, Adam Dunn and Linus Carey achieved the new exceptional performance Grade 9 in Maths and in English Shannon Sutton-Watson and Susannah Leigh gained this accolade. Susannah Leigh also gained an 8 in Maths with another 5 A*/As in other subjects. Linus Carey achieved another 4 A*s and 3 As in his remaining subjects with straight 7s in English. Sam Quance also earned 4 A*s, 2As and 7s in English (7 is equivalent to an A). In English and Maths the grades were based on written examinations only. Charlotte Prime achieved straight 8s in English Language and English Literature, 5A*s, 2 As and a B in GCSE Further Maths taken in an after school class with one of her As being in after school RE. Tegan Tyzack gained 5 A*s, and 8 and a 7 in English and Maths respectively. Hattie Oliver’s hard work was rewarded with 7s in English Language and Maths plus 4A*s and 2As in her remaining subjects. James Barriball gained an 8 in Maths, a 7 in English Literature with 4 As and an A* plus a B in Further Maths. Dan Dunmore was rewarded with an 8 in Maths, a B in Further Maths, a 6 in English Literature and 4As plus an A* also. In the exams retaining the A*-G grading this year there were strong performances as ever. With over a third of pupils taking three separate science to examination level there was the usual 100% A*-C pass rate with 60% of those who took a Triple Science gained A* or A. For the One Science GCSE 82.4% have gained A*-C, which is an increase from last year. In Computer Science the pass mark was 73% A*-C with over 30% of students achieving an A*/A grade. 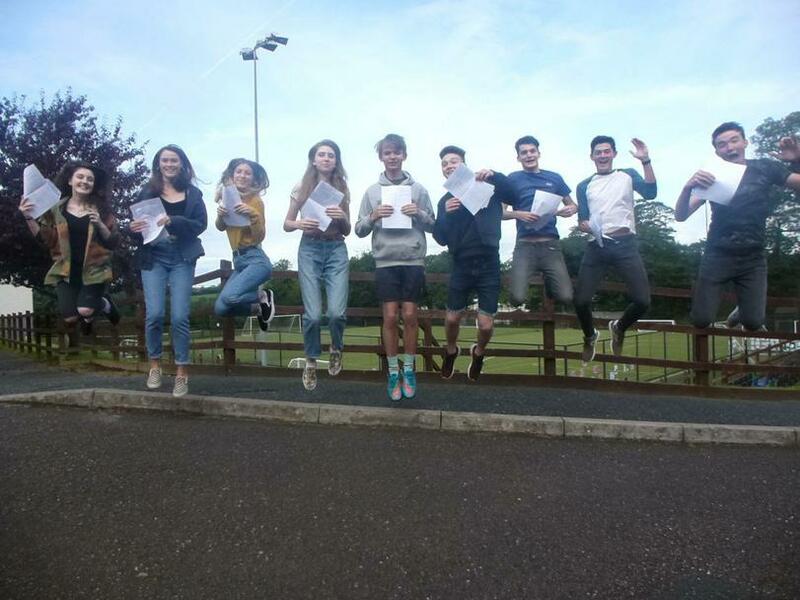 In French the pass rate was 83% and in German 77% A*-C. Geography gained 77%, History 60% and RE was an impressive 88% A*-C. Art gained 76%, GCSE Sport Studies 74% and Music 100% A*-C.
Our students with Special Educational Needs gained good results and it is encouraging that even with challenging GCSE courses they achieved well. Congratulations to all of our pupils, we wish them all the best with their next steps in life we are proud of their achievements.